← Hollywood-inspired Beach-shore Wedding Gala! 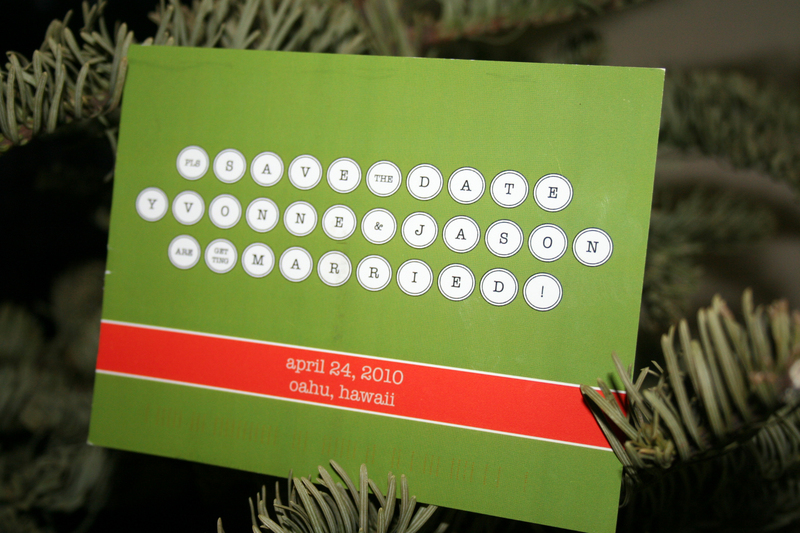 I recently recieved a “Save The Date” card from one of my fabulous brides, Yvonne! She and her fiance, Jason, designed this all on their own and it is so them! First of all, I have to tell you that it was pretty much love-at-first-sight for them…. therefore.. their wedding theme is perfectly titled “Just My Type” …. here is Y&J’s STD card!! (I can’t wait for their spring hawaii wedding!…. think modern spring with an old type touch!). Here is the back of the post card. It’s short, sweet, and to the point! And they signed each of them. REMEMBER: If you are planning a destination wedding… send your “save the date” announcements at least 6 months in advance! Your guests will need ample time to request for vacation and book their flight and hotel!